Started out with an easily readable style, and interesting insights and comments.I put it down when he started whining about the "liberal media". He made an arguable point that economic reporting could be better in the U.S. if economics reporters actually had degrees in economics. Then not more than one page later he declares global warming to be untrue.So, a journalist without an economics degree is unqualified to write about economic issues, but a guy with a degree in production management and an MBA is qualified to comment on global climate change?Hypocrite or egomaniac. Either way, not worth my time. You can imagine the kind of guy who survived the politics of the largest manufacturing organizations in the world, getting called back from retirement to work on increasingly bigger jobs, not quite reaching the top but close enough to provide commentary. This kind of guy will have opinions on everything. Lutz certainly does. You get a lot of inside baseball on the GM of the late 90s and early 2000s. Lutz is best when talking about the cars and the design process. He is not at his best talking politics and management, journalism, or science. But he’s still got opinions. Lutz seems to be the kind of guy you have to keep your eye on. He keeps saying how he is a funny guy, but it certainly doesn’t show in his writing. Because of this inconsistency, I took what he wrote with a proverbial grain of salt. I found this very interesting for the descriptions of the foibles of the design process at GM in the 90s, and the work on the Volt. His descriptions of the people involved in leading car design and manufacturing are well done. I feel it will not stand the test of time as well as, say, John Delorean’s book – the issues seem to be tied to the times more than anything (the government takeover, the rise of Toyota, etc.). As a business book, the story of how GM lost its way in design is a great cautionary tale for all big market-leading companies, and that’s worth reading. While I didn't agree with all of his political insights, Bob Lutz' new book on his years as vice chairman at General Motors is a great read, primarily for those who care about American cars and are stumped when car companies make ludicrous mistakes. Lutz provides a true insider's view as to how General Motors made many self-inflicted wounds which were compounded by economic pressures out of its control that led to its unavoidable bankruptcy. Bean counters and MBA owning brand managers are ripped apart by Lutz in anecdote after anecdote. Likewise, the import biased media comes in for devastating criticism. Lutz doesn't spare himself criticism when it comes to being wrong, but that's not very often. Though part of his thesis is that you can't have success in the auto industry applying the same number crunching analysis used in other industries, he ends his book with some lessons learned at GM that can be applied to other American businesses as well. As a Chevrolet truck owner during the time period covered, I found the whole book insightful. Lutz is now retired from GM, but he continues to step on toes in the auto industry. Recommended. Somewhere there is book that discusses the soul of American business, the important guiding principles of economic success and how American companies have lost their way. It will provide insights for how to get us back on track with a deep and nuanced understanding of the business culture and relevant illustrative anecdotes. Wherever that book is, it is not between the covers of this one. Perhaps the book would have been better served by the title Bob Lutz vs. The Intellectuals: How I saved GM. The amount of time spent on what was, ostensibly, 'the point' could have fit into a single chapter and adequately summarised in single page. Disappointed would be an understatement. I made it through this book - barely. While the author respects design, the writing is terrible and he's a raving lunatic. His position on many topics is so biased, it undermines the validity of nearly everything else. I learned a lot about GM... maybe. Most of what I learned probably wasn't true. The book offers many interesting insights about automobile design and marketing strategy within the car industry, but the author's neo-conservative political agenda was far too intrusive. His belief that global warming is a left-wing media hoax, and that Fox News is somehow notable for its courageous stand against the obvious is flat-out ridiculous. Although I suppose it is not surprising that a leading CEO of the automotive industry would maintain that car emissions and global warming are not linked, just as cigarette manufacturers were convinced that smoking did not cause cancer and it all boils down to a matter of 'personal choice'. I'm sure that England's Prince Charles could probably cook up a dandy defense of 'The Divine Right of Kings' as well. I do agree with Mr. Lutz's overall take on the American car industry in that he feels that, "The operation was a success, but the patient died". I accept and understand his observation that too much 'over-thinking' goes on in the industry, and I agree that it's probably because something is dreadfully wrong with the business management curriculum at the university level. But, I think that his opinion that this was caused by a 'left-wing' bias in American higher education is ridiculously absurd. I suppose the author is trying to come across as 'a no-nonsense kinda guy', but his neocon views soured me to his more valid positions. infallibility & self-worship, hubris and arrogance, 5-5's, 50% of sales to 60s, too much change too many changed parts quality tanked 82-85, cafe std, affordability drives use, yen exchange rate, labor pool, 90s healthcare & strikes, contracts gambled that healthcare like other things with technology may decrease, not market labor rates, contingent settlements drove healthcare costs up, wrong people in charge, journalism only vs knowledge of economics and topic of article, global warming religion, 20% fiat suzuki isusu diesel fuji subaru, toyota played gm, numi prism and chrysler mitsubishi were biased vs same toyota and mitsubishi, vibe and matrix bias of consumer reports, union always more never less, product design too democratic with too much input opposite of apple ipad iphone, often wrong seldom in doubt, errors of commission less than errors of omission, product focus vs analytical masturbation, supplier innovations like apple, less is more in management and products, iaccoca example with media, gas 1/4 others, 80mpg fuel cell equals diesel hybrid, chapter 11 solution to drop hummer saturn 08 mortgage crisis, strike fund too big thus nego, close plants drop labor pool, irreverent meetings and humor to allay fear. Lutz's direct, sometimes harshly condemning, sometimes humble always open style and voice really come through in this utterly readable cross between an autobiography and business critique.He knows the car business like no other. He's no climatologist. Don't be surprised that he's giving his opinions on the car business and business professionals, because the title implies that will be the content of the book. (I read a few reviews when I was picking between this and some other very attractive books that criticized him for being opinionated and basically thinking that he knew all about the car business...duh, he claims it in the title.) I seriously doubt the reviewer from Bloomberg read the whole book, based on his review. His review read like he wrote it before sort-of reading the book.Bob Lutz is the only man I can think of who has been at the helm of all of the Big Three. Let that sink in...He was part of the creation of the Dodge Viper, Ford Explorer, and endless GM products as well a the BMW 3-Series, (He was also Executive Vice President of sales at BMW for three years) so I don't knock him for talking like a "know it all" on anything car-business related. Interesting read if you wan to know/understand more about the Automotive industry, capitalism, how some CEOs think. It's only one man's opinion, though... :) I read it because I wanted to understand how this man thinks.. This is just an awful book. I was up for an insider's view of the auto industry, and some play-by-play between the car companies, labor/management struggles et al. But Lutz is so cocksure so dismissive of so many things and people, he is thoroughly unreliable as a narrator. This book is an account of Bob Lutz's stint at General Motors from 2001 t0 2010. When he joined GM, he did so with the following intent and strategy: "Phase I. Exert my influence to improve products already in the pipeline and use my communication skills and reputation with the media to have them seen in the best possible light. Phase Two. Lead the creation of the future portfolio: cars and trucks of unsurpassed design excellence and characteristics. Cars and trucks so good, so desirable, that customers would pay full price and wait for delivery if necessary. Phase Three. Permanently change the culture of the company, especially around design, planning, and engineering, in such a way that mediocrity (or the dreaded adjective "lackluster," so frequently applied to new GM cars) would be permanently banished. "A common theme in the book - and as eluded to in the title - is the role of the over-analytical wave of thinking (primarily driven by MBA's) which was a contributing factor to the demise of GM. Bob also covers the other factors, that led to the eventual Chapter-11 filing, including rising fuel prices, staggering health insurance costs etc.A very insightful book on the dynamics of the automobile industry both in the US and globally, as well as on leadership, management and execution. The lessons learned can be easily extended to various other industries - which to varying degrees have or are experiencing similar challenges in their respective domains. A recommended read!Below are key excerpts from the book that I found particularly insightful:1- "It's time to stop the dominance of the number crunchers, living in their perfect, predictable, financially projected world (who fail, time and again), and give the reins to the "product guys" (of either gender), those with vision and passion for the customers and their product or service...With the advice and support of their bean counters, absolutely, but with the final word going to those who live and breathe the customer experience. Passion and drive for excellence will win over the computer-like, dispassionate, analysis-driven philosophy every time. "2- "When a major competitot has a systemic cost advantage of that magnitude, he can use it in various ways: - increase marketing spending, -underprice his competitor, -add more features, quality, and luxury to his product, -increase profitability, enabling a faster product renewal cycle. The Japanese did it all! "3- "Health care costs grew and grew, accelerated, as always,by America's unique "contingent fee" legal system, whereby the penniless victim can see justice done by hiring a lawyer who is willing to help "for free" in exchange for a percentage of a possible settlement. Noble intent, but that's not how it turned out...These wasteful procedures and their attendant costs are all due to our (unique to America) "contingent fee" legal system, which results in our health care being the most expensive in the world while at the same time not necessarily the best. "4- "By no means am I suggesting that the media's reverse chauvinism (loving "foreign" more than "domestic") was the leading cause of GM's decline, but together with worker wages and benefits at unaffordable levels, crippling health care costs, and government regulation that caused seismic upheaval in manufacturing and engineering, it created an environment with no margin for error, where only the most astute leadership could prevail. As we have seen, and as the following will abundantly demonstrate, GM's leaders were not up to this admittedly monumental task. "5- "The company cared about...minimizing cost and maximizing revenue - but assumed that the customer desire for the product was a given...I maintain that without a passionate focus on great products from the top of the company on down, the "low cost" part will be assured but the "high revenue" part won't happen, just as it didn't at GM for so many years. "6- "Meanwhile, Ford and Chrysler, the poorer cousins, focused on the Japanese model: don't create new plats unless necessary, automate only where absolutely needed for quality or worker fatigue, seek the optimum blend of humans and machines. It worked, just as decades later it's working for GM as well as it ever worked for Toyota. "7- "Without question, the brand management approach works in the world of soap, toothpaste, and cleaning supplies. The error lies in transposing it to cards, which every one of the former consumer products CEOs tried to do. Here's where it goes awry: a brand manager in the car business can't do a small test batch. Changing the design or engineering of a car consumes hundred of millions of dollars and three years. And the federal government doesn't care whether it's a test batch or not; every car model, regardless of production volume, must be fully certified from an emissions and safety standpoint. Unlike a Crest toothpaste tube, these cars, assuming a negative test outcome, will hang around as worthless orphans for years. "8- "Strongly held beliefs:1) The best corporate culture is the one that produces, over time, the best results for shareholders.2) Product portfolio creation is partly disciplined planning, but partly spontaneous, inspired, all-new thinking.3) There are no significant, unfilled "Consumer Needs" in the U.S. car and truck market (except in the commercial arena).4) The VLEs must be the tough gatekeepers on program cost, content, and investment levels.5) Much of today's content is useless in terms of triggering purchase decisions.6) Design's role needs to be greater.7) Complexity-reduction is a noble goal, but it is not an overriding corporate goal.8) We all need to question things that inhibit our drive for exceptional "turn-on" products.9) It's better to have Manufacturing lose ground in the Harbour Report, building high net-margin vehicles with many more hours, than bieng best in the world building low-hour vehicles that we take a loss on.10) Remember the Bob Lutz motto: "Often wrong, but seldom in doubt. "9- "Product Planning was another area mirrored in a morass of data, attempting to find a quantitative, reliable, repeatable way to come up with hit products. As with everything else at GM, the approach had sterling intellectual credentials, but in a world driven by a whim, fashion, and fluctuating fuel prices, it just didn't work. "10- "The company struggled with the concept of global budgets cutting through regional lines...Running a company by region is fine for many industries but no longer optimal for car companies. You have to go global, with the regions reduced to marketing and PR entities, as is the case with the Japanese, Koreans, and Germans in the United States. "11- "...Of Course, my recipe had called for a gradual rise over time, not an overnight doubling. The gasoline sticker shock (due to the only partially explicable sudden rise in the price of a barrel of crude) had an even more profound effect on our fortunes than the financial crisis, because GM's buyer group was hit the hardest. With Chevrolet and GMC, we were the nation's leading producers of full-size pickup trucks..., and the market was imploding. Pickups are the preferred vehicles of tradesmen such as carpenters, plumbers, and electricians, and their work had evaporated along with new housing starts. "12- "Making GM more open, more human, more accessible, and thus more likeable is the last, great unfinished task. "13- "...Why did Sir Richard Branson (and others), with no higher education at all, succeed so brilliantly in both the airline and music businesses? The simple answer is: they have a blissful lack of awareness of the analytical science of business. Uninfected by the MBA virus, they simply strive to offer a better product, one that delights the customer. They control costs, of course. And they tolerate a necessary level of bureaucracy. It's essential. But the focus is on the product or service...thus, the customer. American business needs to throw the intellectuals out and get back to business! "14- "Astonishingly, in this critical product creation area, where the future of the car company hands in the balance, the much-scorned autocratic style of management works well, and numerous success stories confirm it.The big proviso, of course, is that the autocrat must be so steeped in the car business, and have so much taste, skill, intuition, and sense for the customer, as to be nearly infallible. "15- "The job of the CEO is, in large part, making sure the company is seen in favorable light. False beliefs and unjust accusations need to be tackled, not left to fester in the files of the media, to be pulled out when another negative story is due. I do not see the media, or media exposure, as a negative. A frank, open, and candid approach, with lots of easy access to the CEO, is a winning strategy. "16- "In a sense, the decline, failure, and rebirth of General Motors is simply a metaphor for what is happening to the whole United States. The days of absolute industrial and economic dominance that we took for granted and assumed would go on forever are over. They have been over for some time; we just didn't notice it...As a country, we need to go through this painful collective Chapter 11-like experience. For a time, we need to put the "American Dream" of ever-more, ever-bigger, ever-richer on hold as we grapple with the reality that we are, on balance, far less competitive than we need to be." This book goes through Bob Lutz history with GM and how he saved or helped re-salavage GM. Through this history he addresses an important topic: the problem with American business. Most of the book focuses on GM and his experience with GM which is meant to illustrate what he sees as the problems with American business.However, the part where he actually focuses on American businesses is very short and only talked about in the conclusion. Despite the shortcomings of the book, I think this is the most important part that everyone should read and has important lessons about business.The book is not that well written, but gets the point across clearly. He does attack global warming and rants off about some off-topic things some times but for the most part the book stays on topic and if you plow through you can get some value through his story of GE. He does focus a lot on himself and how he saved GM and it is fairly self-centered. I don't know, maybe he was the hero of the day for GM but he certainly makes it seem like that. Going into this, I was hoping to get a lot more on GM's bankruptcy and the decisions surrounding that and more discussion on that. I was disappointed though, he didn't talk much about that at all. The book was (almost) entirely focused on the more earlier periods of GM's history and more about his role in GM. I stopped reading when he started denying climate change. To be expected from someone at the top of the car industry, I suppose. Bob Lutz is hard not to like. 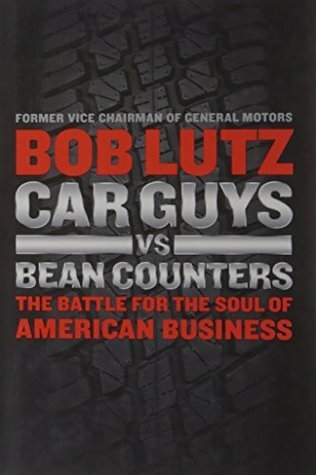 'Car Guys vs Bean Counters' is an enormously entertaining account of how Lutz returned to GM to help turn the company around. He gleefully documents the astonishing dysfunctions operating within GM at the time-- a cadre of professional yes-men, a product development process wholly subjugated to spreadsheet jockeys with no interest in automobiles, and a fixation on the greatness of GM's past, driven, one is led to conclude by a loss of faith in GM's future. Lutz simplified GM's approach by insisting that the company should focus on primarily one thing: designing, building, and selling cars that people will love. His take-no-prisoners leadership style led him to clash with many around him, but the reader is left with the unshakable conviction that such a dictatorial management style was needed to turn the ship around.His memoir suffers from a generous injection of RNC talking points. From the evils of unionization, to the demonization of teachers as the main reason why America's education system is failing, to the utterly erroneous account of how the mortgage crisis was caused by liberal do-gooders forcing banks to give home loans to minorities who would never be able to repay them, Lutz gets a '10 out of 10' rating from the Heritage Foundation for parroting such canards. In one passage, he attempts a bit of failed centrism by contrasting "the lunatic left" with "the vocal right". Fortunately, the reader may skip over such tangents as they have little to do with his main narrative.The cast of villains wheeled-out by Lutz is long, and includes--* The Japanese, whose success in the auto industry Lutz disingenously attributes solely to the weak Yen instead of superior product design. * Liberals, whose insistence on CAFE emissions regulations Lutz argues dealt a body-blow to the auto industry. One must ask whether, in absence of such regulations, the big three would have spontaneously opted to reduce emissions. * Wide-eyed environmentalists, who Lutz claims unfairly blame GM for making big cars, when it was simply responding to a legitimate market demand. (Talk about an abdication of leadership. )* The media elite, who, allied with their leftist ties in government, conspired to criticize GM and lionize the Japanese because (presumably) liberals hate America.This endless parade of culprits becomes a tiresome blame-game which undermines the truth of Lutz's central thesis: GM was nearly destroyed not by exogenous forces, but from an epic failure of internal leadership. This failure created a vacuum which was quickly filled with an army of spreadsheet-wielding MBAs who cared little about making great cars. Lutz's legacy is how he stripped these number jockeys of their power over product design and put car guys back in charge. Fortunately, 'Car Guys' is a light read, and the reader may skip through Lutz's tirades where they fail to ring true without missing the main thread of his wonderful narrative. I have followed Lutz (or maybe, stories about Lutz) since his days at Chrysler. Not afraid to tell it like it is or how it should be, I found his candor refreshing. His passion about product parallels that of Steve Jobs, but certainly in an entirely different industry. Bottom line: Success lies in customer satisfaction with the holistic product experience. Probably my favorite line in the book was Lutz' quote: "Throughout my career, I have always been surprised by how often people mistake customer satisfaction for an absence of complaints. "Lutz' insider insight changed my understanding of the government's role in helping to restore GM to profitability. One big surprise for me - GMAC had a mortgage arm? WHY? It's no wonder they lost focus, and when the meltdown occurred, they were doubly impacted by the subprime disaster and fast rising fuel prices. The title really tells it all. GM truly had the talent to make great cars, but the product designers and engineers were held back.Yes, Mr. Lutz has opinions about politics and the media, but objectively speaking, he gives it to both sides. One side hated the Detroit Three domestic manufacturers while the other side hated the government role in the automobile company bailouts (you can guess which was which). They were both wrong. Lutz clearly articulated how the US consumer-driven tastes and demands, within the environment of historically low fuel prices, drove demand for the vehicles that ultimately tanked in sales during the meltdown, despite fuel economy "standards." I actually agree with his recommendation to slowly increase fuel prices, to compete long term in a sustainable way with the European and Asian companies. Fuel prices need to influence market demand, rather than the government creating arbitrary fuel economy standards to force demand.To be honest, I was not a GM supporter during the post-meltdown, but now understand the history better. As a car enthusiast and (unfortunately) frequent renter, I drive a lot of vehicles. I have actually been impressed by the new Malibu and Impala, even commenting positively. After being a non-GM owner and often anti-GM advocate since a poor dealer experience in the 80s, I would consider a GM vehicle, even more so with an understanding of the customer focus that Lutz brought back to GM. There are two quotes that I found the most valuable parts of this book:"...give the reins to the "product guys" (of either gender), those with vision and passion for the customer and their product or service.It applies to any business. Shoemakers should be run by shoe guys, and software firms by software guys, and supermarkets by supermarket guys. "(from the preface)"In one endless Automotive Strategy board meeting, we were faced with an onscrean five-by-five matrix, which, in its twenty-five cells, listed every known corporate priority. These ranged from "increase market share," reduce assembly hours per unit" and "speed time to market" to "achieve diversity targets and "reduce LTI (senior executive) count." Buried somewhere in the middle of this grand mosiac was one little cell, no bigger than the others, which read "achieve product excellence. ".....There, on the screen, was the core of the problem; "product excellence" was merely one of twenty-five five things the company should work on. That matrix should have been in the shape of a giant sunflower, with a huge "PRODUCT EXCELLENCE" in the giant circular field, with all the other initiatives forming pretty little yellow petals around the periphery." (P84)I'm going into business, and I think this is very useful advice. But since I'm not going into the car business, and don't have any particular interest in cars, I found most of this book quite dull. Hence the low rating. The above 2 quotes are a great parable for anyone striving to succeed in any enterprise, and I suppose the rest of the book explained exactly how and why it worked (or didn't) in the case of GM. But the as interesting as the parable was, I couldn't stay focused on the story itself, and it took me a long time to get through it.Beyond that, which may be simply a matter of personal taste, there is one specific complaint I have. Lutz repeatedly blames GM's failure on the media and environmentalists, which I found odd because the rest of the book goes on to explain how grotesquely mismanaged the company was. In that kind of atmosphere, and with a plethora of wrong focuses to boot, no outside source is required for a company to fail. Look at the source. Look at what's failing. It's not like there's some big mystery here. Bob Lutz, with 40 years experience under his belt, joined General Motors as Vice Chairman. Lutz is a car guy, and was brought in to help GM produce a better product line.GM's President in the 1950's famously said "what was good for the country was good for General Motors" and Lutz picks up this theme; though updated in a negative sense. The same issues that ultimately led to GM's bankruptcy also plague American business in general (and, therefore the overall economy). The list of errors, from government mandates, weak Yen, slow-to-change UAW, to name a few is long. The major issue though, in Lutz's view, is that management became too financially focused. There is a scathing chapter outlining the misguided approach of business schools and their intellectual, quasi-scientific approach. The dreaded Bean Counters (1980's or so) took over and lost focus on what the end customer wanted. This loss of customer focus lead to poor products, declining market share, tighter marketing budgets, etc.. It was a downward spiral GM found hard to recover from (in the 2000's the auto side of the business was being propped up by the finance/mortgage side).Lutz often says other Senior Executives would counter his viewpoints by saying 'we need hard data, not Bob's hunches.' Perhaps in auto circles Bob's hunches were better then hard-data (Lutz certainly thinks so); however the book suffer from some of this same hubris. Lutz makes lots of claims and charges with little to no substantiation, just take his word for it. Overall, this book gives a good overview of the challenges GM was facing; and it makes a strong case that as GM gets back to basics it is also the recipe for America. Post-Great Recession Lutz advocates getting away from a financially-focused economy (swapping paper be it bonds or derivatives on Wall Street or short-term, quarterly profit driven CEO's running public companies) and back to one that produces things. This, too, is one of 'Bob's hunches'. Car Guys vs. Bean Counters is a thought-provoking commentary from auto industry maven Bob Lutz. Lutz built a career as a staunch opponent of bureaucracy and by placing the utmost importance on knowing the product as well as the customer. His career has taken him across all of the Big Three auto manufacturers, which has given him a rare sense of perspective of the strengths and weaknesses of each. Without going into an exhaustive summary, I thoroughly enjoyed this book. In the early chapters, Lutz details the mess that was early-2000s GM in gruesome point-by-point detail. GM management had a seemingly insatiable addiction to PowerPoint presentations and useless vanity metrics. The company also tried some half-baked culture-change experiments like the doomed Advanced Portfolio Exploration (APEx) group, intended to be a think tank for the next generation of vehicles.Lutz is unapologetic about his business strategy and his politics (including a broad skepticism of the role of automobiles in global warming), and is undeniably self-indulgent at times. But on the whole he doesn't come across as a jerk per se--more like a guy who has seen far too much corporate BS in his career to have any remaining patience for it.The automotive industry needs more people like Lutz. I just hope that they get the leadership in time before companies like Tesla make them irrelevant. You can always count on Bob Lutz to say what he think. No hedging. No apologies. No high falutin' language. And that's what makes this book an entertaining read. And a bit mind boggling. I felt like I was reading about GM in the 1970s when the US auto industry was reeling after the oil embargo and the onslaught of foreign carmakers who had been building cars designed for high fuel prices for decades. But this was GM from 2001 to 2011, and they still had a lot of lessons to learn. Bob Lutz was only too happy to try to teach the product development folks at GM lessons when he returned there in 2001, after a very successful career with Ford, BMW and Chrysler.Lutz deals out a lot of common sense in this book that could apply to many businesses, not just car companies. And yes, Lutz definitely has no shrinking ego problem. But at the same time, he is very quick to applaud managers in Design, Manufacturing and Engineering at GM who came alive and really performed once corporate obstacles were removed from their path. He is also realistic in his appraisal of his weaknesses in a chapter late in the book, reflecting on what he would have done differently were he GM's CEO.You don't have to be a car guy to enjoy this book. It's a fascinating look at the recent history of the automobile industry, while also providing lessons for all managers. I think this says it all about how GM lost its way:'[P]roduct excellence' was merely one of twenty-five (or thirty-six) things the company should work on. As I later told Rick Wagoner, that matrix should have been in a shape of a giant sunflower with a huge "PRODUCT EXCELLENCE" in the giant circular field, with all the other initiatives, helpful as they were to the achievement of the big one, forming the pretty little yellow petals around the periphery.It seems Lutz at times is more interested in taking potshots at the Liberal Media, Japanese car companies, and climate change policy advocates - but surprisingly, not the unions as much - but an interesting look at the inner workings of GM during this period. As dysfunctional as GM was, the surprise is not that it had to declare bankruptcy, but that it the company lasted for so long and that it was able to emerge from bankruptcy with (hopefully) a robust car lineup and a competitive cost structure. Especially insightful were the nuggets of what makes for a good car - the fit between body panels, well-designed dashboards, chrome accents, and quality paint jobs - things I don't think about but what instinctively catches my eye. I'd probably actually give this one three and a half stars. It's one [very outspoken] man's opinions of what went wrong with GM over the past few decades. I really enjoyed Lutz's behind-the-scenes stories about just how terminally screwed-up GM's culture was when he arrived in 2001 (and even a few stories about what he saw there from across town at Chrysler). Less enjoyable was his over-the-top criticism of the media and Toyota. When I flipped back to the index to see how many pages referred to Toyota, I was surprised that it was only about a dozen or so, because it seemed to be every other page.As anyone writing something autobiographical would probably be inclined to do, Lutz glosses over his missteps and has little self-criticism. For someone who spent nearly ten years guiding product development at GM, only the very last products created under his watch (the current CTS, Equinox, Terrain, Malibu, and LaCrosse) have actually been successful sales-wise. He takes little responsibility for sales flops like the GTO, G8, Solstice, Sky, Astra, etc. that he pushed to bring to the US.Overall, he's a talented storyteller and the book is a pretty easy read (three days, a few hours per day). That I got a free review copy the week it's released was just gravy. The book was sort of advertised as a comment on American business being run by accountants instead of people interested in the product and the customer. But it was more of a look at General Motors and how they got into financial trouble. Part of book brought up examples of GM leaders forgetting the customer in an effort to satisfy internal goals. Bob Lutz also took shots at the media he thought was pro-Toyota and Anti-GM. Near the end of the book, he talks about how GM traditionally ignored the media or were even hostile to it. So, no surprise if they didn't give GM the best press all the time. He also failed to comment on incidents like exploding gas tanks and consumer safety in cars that damaged the industry. Personally, I always hate the excuse that the media was the problem. The book is interesting and it is short, so it can be a quick read. And near the end of the book he tries to explain how treating business administration like a science with charts and numbers has hurt companies. Basically, he says it's all about satisfying the customer. In the end I agreed with some of his ideas and disagreed with others. What you wonder about at the end is are there any CEOs listening to this. Bob Lutz seems like the kind of guy i would have really liked to work for. He is blunt to a fault, and never fails to question why the Borg is doing what it's doing. Other than some parts where Lutz gets a little over-excited about the liberal press and the global warming types, the book was great. The author focuses mostly on the 8-9 years he spent at GM up until retiring in about 2009. He was instrumental in resetting the design culture of GM to focus on differentiated, desirable and very high quality cars. Lutz's influence can be seen in the Chevy Volt, Pontiac Solstice, the new Camaros, and the new Cadillacs and Buicks...all cars that can compete with those designed and manufactured anywhere else in the world. Some of Lutz's anecdotes about how things were done, or more often not done, at GM in the old days are cringe-worthy. As even he admits, perhaps GM had to go through Chapter 11 and bring in all new mgmt in order to free itself from the group-think that had such a firm grip. The book was a quick read and very entertaining, with lots of great insights into how to manage teams in a large company. Highly recommended. I'm not a car or business person, but I found this book to be a quick read and an interesting history of the American auto industry. One major lesson from the book, and the meaning of the book title, was that creativity can not be measured the same way that efficiency in a factory is measured. The quality metrics used to ensure consistany in production, box in design when it should be innovative. Another lesson was the importance of public image. Bob Lutz wrote about the joint venture between Toyota and GM, when Toyota Corollas and Chevy Prizms, were both being built at the same California plant and essentially the same car, but the Corollas were rated higher by drivers in Consumer Reports. He attributed this to the idea that people who drove the Corollas thought better of Toyota (as a smart company) than people who drove Prizms thought of GM (a bloated behemoth). It was an image that Bob Lutz tried very hard to redefine. This was a highly entertaining read on american business, in particular the auto industry, by one of the more polarizing people in the industry. Some of the stories and anecdotes are amazing and some will just have you shaking your head at the ridiculousness of how companies like GM completely forgot about their primary purpose...THE CUSTOMER! One thing I found interesting was that there were some similar, if not identical stores/anecdotes that were in Lee Iacocca's Where Have All the Leaders Gone?. While I would have liked A LOT more detail this was still an interesting read, especially if you are unfamiliar with large american business and the auto industry. Bob Lutz is clearly outspoken in everything he does. This book, like his previous work, Guts, leaves everything on the table with nothing held back. For that I respect the man. Unfortunately, Lutz also has a do-no-wrong attitude and assumes that his way is always the best way. When things go wrong, it's never his fault, and when things go right, it was always his idea. Errors he does admit to are pushed aside as minor flukes. BUT, putting aside any distaste for Lutz's personal attitude, his writing is intelligent, entertaining, and narrative, which makes for a good read. I work in the automotive industry, so I found this book to be particularly relevant to my interests; however if you are not in the automotive industry then perhaps you might deduct another star from my rating. I drive a GM product now. The first time ever. Its well made, but also compromised. Though the new GM must surely be better than the old, I can't help but think that some of the old is alive and well. Now driving this vehicle, I think back to the chapters where Lutz describes the many spreadsheet matrices of specific characteristics, and cost, and time to market for each, and I can see that these decision points are still being used. The difference between a pretty good vehicle, and a great vehicle being the actual time spent to weight the importance of features to the actual user, and focus on the whole to bring it home.Lutz has had a profound effect on the New GM, unfortunately he retired before he was done. I've never been a big fan of GM's cars. I think a big part of that is the cars they produced while I was growing up in the '90s were quite boring. The very cars that suffer from the guidelines set by the so-called "Bean Counters" in Bob Lutz' book. This is a fascinating account of how a company went from designing desirable cars to letting numbers and strict rules create the vehicles they produced, and then Lutz' attempts to destroy those guidelines. In my lifetime GM has gone from boring to at least attractive, and I'm sure Mr. Lutz had something to do with that. He can get a little long-winded sometimes, but overall I would recommend this book to anyone who has an interest in the automotive industry and how it works. This really is a good book for people inside and outside of the American manufacturing sector. It is easy to read (for those outside of manufacturing) and explains that the problems are not black and white (for those inside that judge too quickly).It was refreshing for a writer to poke at both extremes of the media too. The only thing it lacks is a bold gesture or challenge to companies to fully reward American innovators. Lutz was an executive and played an important role. He doesn't explain why auto company executives deserve pay that is 1-2 orders of magnitude higher than the people that turn their ideas into reality.